The iPad is getting more Pro all the time, but we’ve always had professional-grade accessories, and when you want to look businesslike, nothing beats a nice folio case. Office product purveyor Fellowes just released its MobilePro Series of business-class cases aimed at people who travel with their iPads. 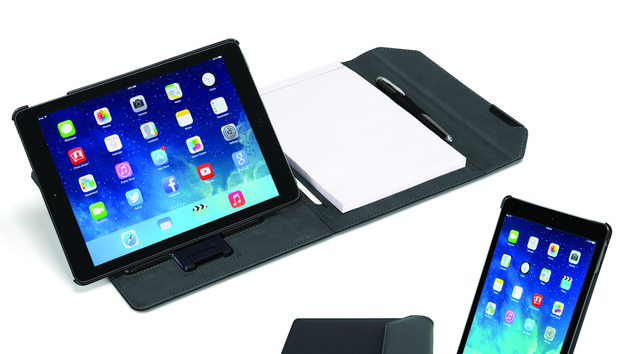 The series features folio cases with integrated iPad stands and room for a pad of paper, as well as a Bluetooth keyboard. I got my hands on them early, and while I like the cases a lot—the stand is particularly cool—the keyboard has one big flaw that makes typing on it an exercise in annoyance. The Bluetooth Keyboard can piggyback on the Deluxe Folio thanks to magnets inside. Inside, there’s room for a pad of paper on the right side—the iPad Pro sized folio I tested has a full-size legal pad. (Lefties can easily flip the orientation and have the iPad on the right and paper on the left.) Two stretchy loops ably secure a pen for writing as well as an Apple Pencil or other stylus, and there are pockets behind the notepad to hold business cards and other papers. All the stitching is well done, the materials are nice without being over the top luxe, and the loops seem like they’ll stay firmly attached even as the folio suffers the rigors of travel. 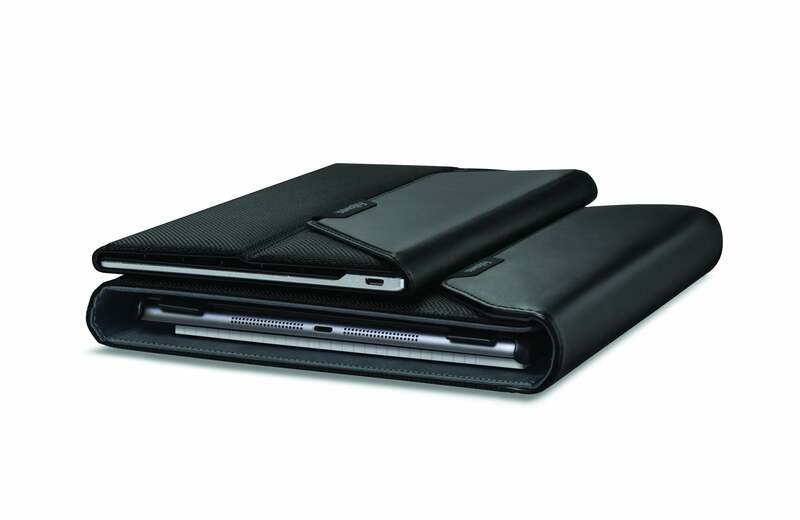 The Deluxe Folio has a pocket behind the notepad, slots for business cards, two pen loops, and a really great iPad stand that you can use in the folio or separately. The iPad side of the case has a plastic attachment system for the removable SmartConnect Case. The case snaps around your iPad, and features a stand that holds the iPad in landscape or portrait orientation, at three viewing angles. It’s not the lightest iPad stand I’ve tried, but it’s sturdy and easily adjustable, and I love how you can use it inside the folio, or snap it out to use it on its own. Even better, when you want to remove the iPad from the case, it pops right off—you don’t have to pry your iPad out with so much force that you wonder if it’ll snap in half. 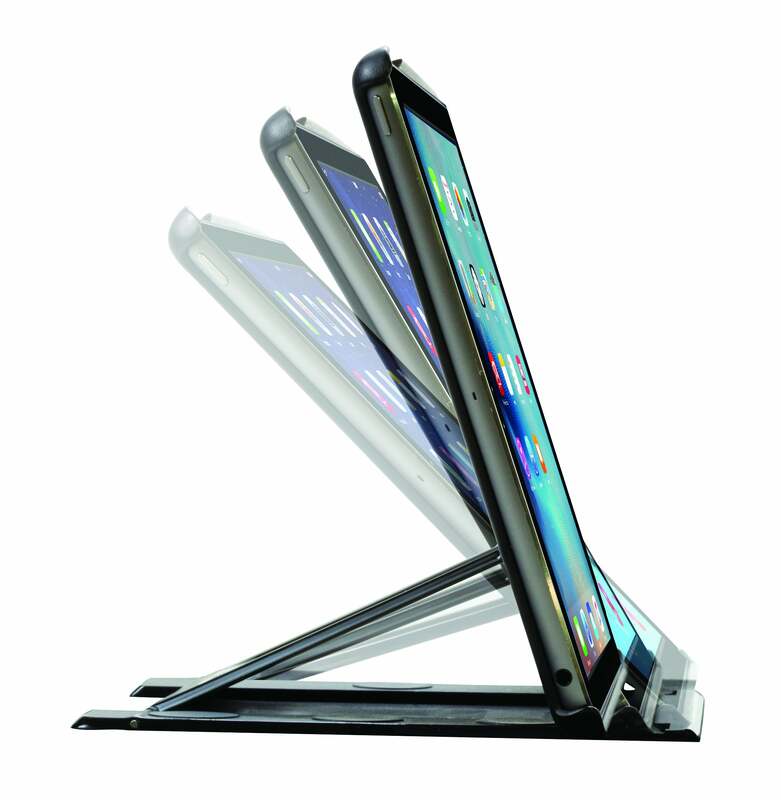 The SmartConnect case can hold your iPad in portrait or landscape orientation, at three viewing angles. 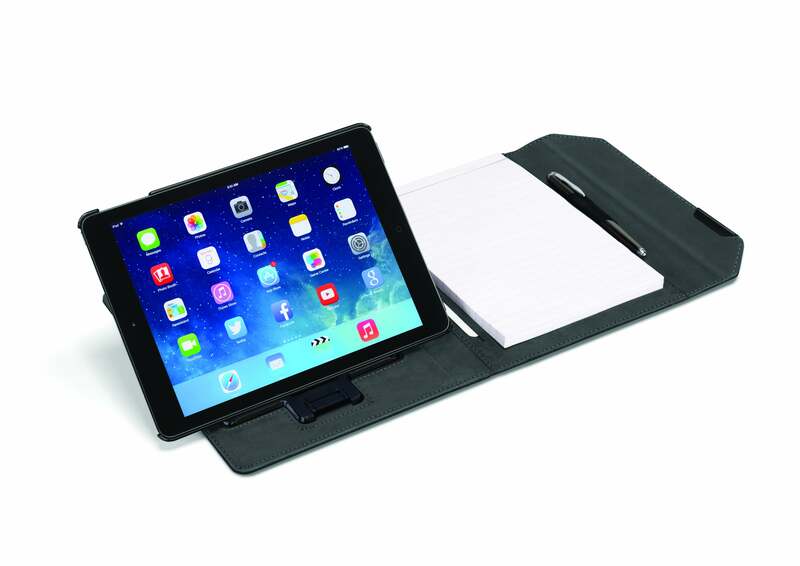 So much better than a soft, wobbly “stand” that’s just a folded-up iPad cover. The MobilePro Series Deluxe Folio comes in versions for the 12.9-inch iPad Pro (which we tested) for $100, or for iPad Air/Air 2 for $80. (Presumably the iPad Air 2 version would fit the 9.7-inch iPad Pro—I’ll update this when I find out for sure.) There’s also a version for the iPad mini for $70, which I particularly loved since it works just like the big one, but is so much smaller and lighter, with a mini pad of paper ready to go. Unfortunately, my love didn’t extend to the separate keyboard. While the iPad Pro-sized Deluxe Folio has enough room that you can store your iPad in its Smart Keyboard cover right inside, Fellowes’ own Bluetooth keyboard is a separate piece, in a matching folio-style cover that you can’t remove. Its materials match the folio, and I like how the magnets hold them together when they’re closed, as explained above. When the keyboard is open, you can use its case’s folio flaps as a wrist rest or tuck them underneath the keyboard, but I wish I could pop the keyboard out of the cover instead. The Bluetooth Keyboard with Carrying Case is always with its carrying case. That’s not the main problem, though. It’s the typing. The plastic keys are clicky enough, with more travel and a more satisfying typing feel than Apple’s Smart Keyboard for iPad Pro. Apple’s keyboard is covered in fabric for a spill-resistant design, while Fellowes’ keys are open, which is my subjective preference. There’s no backlighting, but the Function buttons contain plenty of shortcuts, for going back to the home screen, copying and pasting (key commands work for that too), controlling playback, even jumping straight to iOS’s Spotlight search. I keep pressing the Up arrow when I mean to press Shift, and it’s driving me so crazy. The dealbreaker is the Shift key. On the left side of the keyboard, it’s a nice long Shift key, like it should be. My problem is I never seem to use the Shift key on the left side of the keyboard—as in, ever. The right Shift key, which my right pinkie goes for automatically, is a regular width key, and the keyboard crams the up-arrow key between that “short Shift” (heh) and the / key next to it. This led to two problems. Second, typing a question mark suddenly got so hard because the two keys involved (shift and slash) are no longer next to each other. You have to reach around the up arrow key between them. The keys themselves are pretty small—fine for an iPad Air-sized keyboard, but keep in mind I’m using it with an iPad Pro—and I found that to type a question mark in this weird way on these small keys meant I had to physically look at them while I was doing it, and it slowed me down every time. The MobilePro Series Executive Folio, which I didn’t test, integrates the keyboard into the case. The MobilePro Series Bluetooth Keyboard with Carrying Case retails for $65. 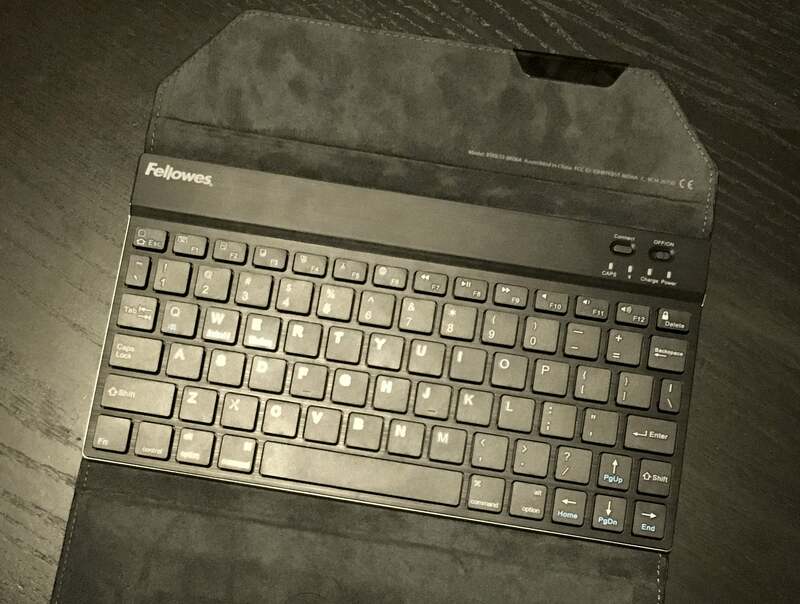 Fellowes also has a MobilePro Series Executive Folio ($150) for iPad Air and iPad Air 2 that integrates the keyboard right into the case, but we didn’t test that one for this review. I wanted to like the keyboard as well as the folio, because they just match so well. The keyboard’s flaws will send me back to, well, any other keyboard, but the MobilePro Series Deluxe Folio is a keeper.